There is a new shared data that shows 1 in 3 young men don’t consider checking a partner’s email or phone without her consent to be domestic violence. From your feedback, we understand that we needed to provide more information about how this behaviour is an example of domestic violence. When thinking about men’s violence against women, many people think mainly of physical violence. However, abusers use many different types of behaviour to gain and keep control in relationships. The chart below shows how physical abuse relates to other forms of abuse, including controlling behaviours. Checking a woman’s email or phone without her consent is an example of controlling behaviour.This behaviour can isolate a woman, cutting her off from family and friends and violating her personal boundaries. It is a psychological abuse tactic known as ‘coercive control’. Technology such as email and phones can also be used by abusive men to stalk and monitor women. 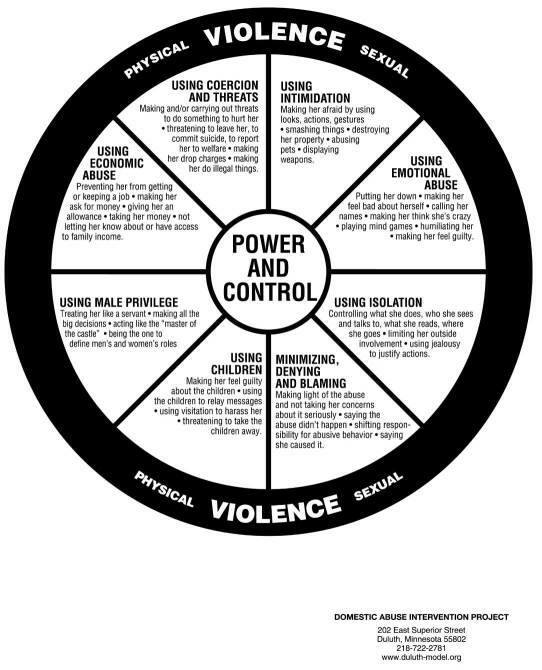 The Power and Control Wheel was developed from the experience of abused women in Duluth, MN who had been abused by their male partners. It has been translated into over 40 languages and has resonated with the experience of abuse survivors world-wide. One of the most effective ways to begin to overpower another person is to keep them from having contact with others. By systematically severing relationships with family, friends, and co-workers, the batterer insures that the victim has little support. The batterer becomes the person’s only point of reference, thereby defining and controlling their world. Batterers can isolate their partners in a variety of ways, from excessive jealousy to restricting their access to education and jobs or controlling where they go or with whom they spend their time. For people with disabilities, lesbians, the elderly, immigrants, or others who are marginalized by mainstream society, isolation takes on an increased potency. Batterers often minimize or deny the abuse, or they blame their partners for provoking it. The batterer may minimize the severity of a person’s injuries, or outright deny that they caused them. Unfortunately, “victim-blaming” is prevalent in our society. Sometimes abusers play mind games with their victims trying to make them feel crazy. Often violent behavior towards people is justified by saying things like “they asked for it” or “they needed to be put back in their place.” In so doing, the blame and accountability shifts from the abusive behavior of the batterer to the “weakness” of the victim. Using children is yet another way that a batterer can instill feelings of guilt and incompetence in his partner, making them feel like a “bad” mother. Some batterers will force children to turn against their mothers, or will threaten to take the children away if the victim were to try to leave. There is also evidence that in homes where there is abuse towards the mother, there is an increased likelihood of abuse towards the children. Girls whose fathers batter their mothers are 6.5 times more likely to be sexually assaulted by their fathers than are girls from non-violent homes. Please keep in mind, that the reverse can be true, as well. In our patriarchal society, men are often raised to believe that they have been given the right to be dominating and aggressive. Being “tough” and “in charge” are accepted and expected as part of one´s manhood. It is all too often the case that batterers use this gender imbalance as a justification for violent or controlling behavior. Please keep in mind that not all males are batterers, this simply refers to those who are. By controlling and limiting a person´s access to financial means, a batterer can assure that his victim will have limited resources if they have thoughts of leaving. They may have to turn over their paycheck, leave their job, or account for every penny spent. Too often victims have to choose between staying in an abusive relationship or being thrust into economic ruin or poverty. Threats are used to control by creating intense fear that can paralyze the victim’s ability to act or keep them self constantly on guard in an effort to protect their lives or well-being. Some common threats are suicide, threats to kill their children, threats to damage property, etc. The victim may also be coerced into acting in ways that contradict their values, such as prostitution or fraud. Abusers will often commit terrifying acts in order to keep their partner in a state of continuous fear. This may include smashing things, killing pets, harassing friends and family, setting fires, driving recklessly, suicide and homicide. Intimidation periodically reinforced with assault, makes violence a daily part of the victim´s reality and, therefore, makes the victim easier to control. Emotional abuse is the most common form of control and can often exist in relationships where there is not physical battering. This includes put-downs, insults to the victim´s intelligence and abilities, name-calling, etc. In so doing, the batterer systematically breaks the victim’s spirit and self-esteem. The victim may begin to feel as if the abuse is their fault or that they must deserve it. These forms of abuse are used in multiple combinations. Constant violence and criticism leaves victims uncertain, humiliated, and much easier to control. is there a support group for Oromo Men who have committed domestic violence and are trying to become better men by working on their communication skills and behavior?